Deer meat was on the menu in a three-day promo that brought together the local Rotary Club, a nonprofit that feeds the hungry, and Market Pizza in Stockton, New Jersey. Megan Jones-Holt, the pizzeria’s chef and owner, hit upon the idea of making venison pizza for a Rotarian-sponsored fundraiser tied in with Hunters Helping the Hungry, which provides the needy with wild deer meat. According to Jones-Holt, the venison is cut with beef fat for a less gamy flavor. “I didn’t want to do something so far out of left field that people would be hesitant to try it,” she says. “The deer has been marinated in extra-virgin olive oil infused with basil, oregano, tarragon, thyme, salt and pepper—all good herbs that one would put on ground beef. The meat was precooked before going on the pizza.” The pie also features fresh mozzarella, Parmesan, crushed tomatoes, red onions, jalapeños and oregano. “The venison is crumbled on top, then finished off with birch-smoked salt from Iceland and fresh sweet basil,” Jones-Holt adds. A portion of proceeds for every venison pizza sold went to Hunters Helping the Hungry, raising enough money to serve 4,000 meals to the hungry, according to Jones-Holt. The artisan pizzeria continued to offer wild-game pizzas—including wild boar bacon, smoked duck and bison—for the next three weeks. For more information about Hunters Helping the Hungry Needs Help. Reprinted with permission of PMQ Magazine, PMQ.com. 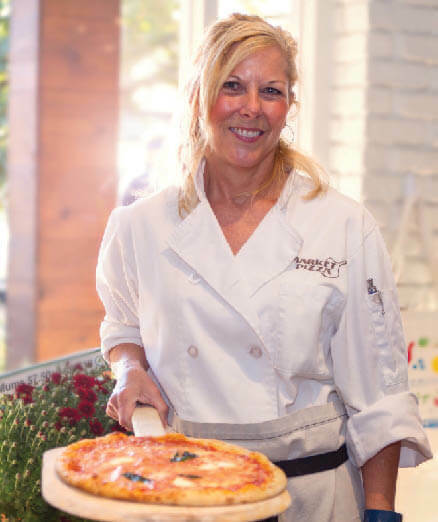 Owner/chef Megan Jones-Holt creates a true farm-to-table experience at Market Pizza in Stockton, New Jersey, designing artisanal pizzas using locally grown ingredients like mushrooms, sausage, prosciutto, eggs and vegetables. « Are You a Locavore?